Since the success of Harry Potter, producers have been trawling teen fiction for the next big franchise. Frustratingly, they tend to chop and change the core things that make their chosen series a success and their franchise falters after the first film: The Golden Compass, Percy Jackson, The Seeker etc. However, when well written fiction is adapted faithfully and filmed with consideration for the source material, you can produce something of immense power and value – refreshingly, The Hunger Games is one of those adaptations. The Hunger Games is set in the futuristic nation of Penam. This kingdom is divided into thirteen core regions, inhabited by the wealthy, upper-class, privileged elite of the Capital and the poor denizens of the twelve outlying Districts. For the last seventy four years, the citizens of the Districts have been required to offer up a male and female candidate between the ages of 12 and 18, to fight to the death for the amusement and financial gain of those in the Capital; this annual contest is called The Hunger Games. As the plot progresses, we discover that this entire operation is merely a socio-political tactic to keep the working class Districts in line, through fear and obedience. 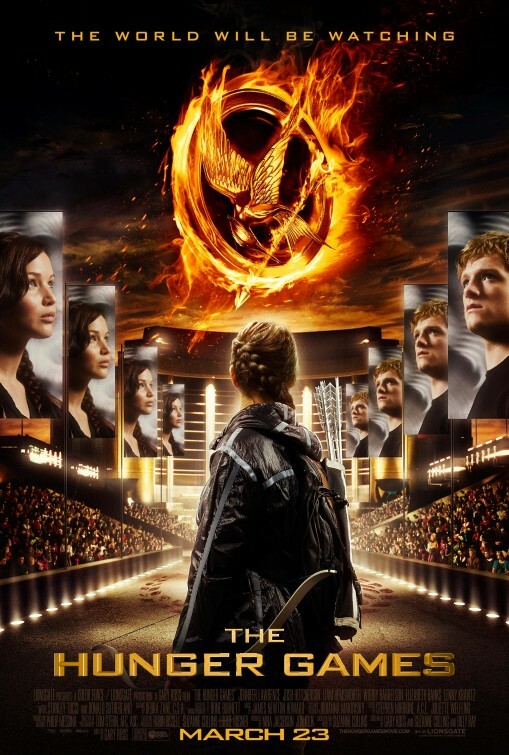 The central characters are Katniss Everdeen [Lawrence] and Peeta Mellark [Hutcherson], who are chosen (technically Katniss volunteered to spare her twelve year old sister) to represent District 12 by training then competing against 22 other young adults – of course, there can be only one victor. The plot presents brilliant political satire and an anthropological exploration of interactions in adolescent society, combining the best elements of Battle Royale and Lord Of The Flies but (from what I’ve been told by those who’ve read the novels) evolves to become something far greater. The visual effects, production design and costumes are breath-taking, from the poverty-stricken District dwellers to the delightfully eccentric Capital populace, every detail is exquisite. As with every decent work of science fiction, you can’t help but feel you want to know more or see more of the other Districts or life in the Capital. Obviously, the plot perspective is focused on Katniss, so although elements may feel underdeveloped, it’s quite apparent that the screenwriters have simply tried to retain as much as possible from the books without compromising the narrative. If anything, wanting to know more about a fictional universe is a positive and compliment to author, Suzanne Collins. To my mind, the film was littered with impressive performances all round. You could argue that the supporting characters aren’t fully explored but as stated earlier, this is Katniss’ story, told from her perspective and to pad the script with unnecessary exposition and banter, just to please the fans, would have crippled the pacing and flow. Curiously, casting priority is divided between the twisted individuals from the Capital and the youngsters participating in the game itself – by that I simply mean that screen time is heavily biased toward the adults, with less exploration into the mindsets and inner-workings of the young competitors. Those explored can be split into three distinct categories, the first being President Snow [Donald Sutherland] and Seneca Crane [Bentley], the game designer; both men give wonderfully subtle performances, providing a pleasant juxtaposition between someone who wants to produce an entertaining spectacle and one who truly understands its necessity. The second group are the commentators and the faces of The Hunger Games, Caesar Flickerman [Tucci] and Claudius Templesmith [Toby Jones], who provide a great deal of expositive insight while embodying these memorable characters. Finally, we have the three key mentors of the District 12 representatives, the vilely over-the-top Effie Trinket [Banks], the drunken previous victor, Haymitch Abernathy [Harrelson] and the stylist, Cinna [Lenny Kravitz]. Harrelson is wonderfully entertaining, combining a wealth of charm layered beneath his roguish exterior and Banks and Kravitz are both simply unrecognisable – Banks because of the lavish make-up and costume design, Kravitz for the fact that he’s actually provided a stand-up performance. It would have been nice to see more of the development of the other Tributes but there simply isn’t enough time in a theatrical release. In trying to keep this film within the boundaries of a 12a/PG-13 release, this film has been keenly directed and edited, pushing the envelope of violence and brutal terror in what could be described as a teen film, without resorting to unnecessary gore or dumbed-down nonsense. If anything, the true nature of violence is presented without glamorisation or cinematic exaggeration. No doubt, the nature of the film will cause a bit of a stir and controversy toward the usual complaining parents, who condemn a release before watching or even fully researching it but that can’t be helped. Then you’ve also got to worry about the loyal fans of the source material, no one is harder to please than them and they will probably be the film’s greatest supporters and its harshest critics. If the series continues to match this opening instalment’s positive debut, we can hope for a thoroughly enjoyable and wholly successful franchise. Personally, I think the universe we’ve glimpsed is strong enough to draw crowds and appeal to a wide demographic of cinemagoers and see no reason to expect anything less than excellence from the coming sequels. Amidst all the realism, tension, action and drama, I found myself enjoying the brief interviews with the games’ contestants, as hosted by Caesar Flickerman. Stanley Tucci has an incredible presence in everything he’s in, so it’s nice to see him succeeding so thoroughly. The interviews start off as little more than a montage but they’re the first opportunity to really explore the two leads and witness how they’re sucked in by the glitz and glamour before the main ordeal. All of which is elevated by the commendable score by James Newton Howard and T-Bone Burnett. After seeing Winter’s Bone, it became immediately apparent that Jennifer Lawrence is an incredibly gifted actress, able to hold scenes with grace and ease but still able to channel deep emotional resonance when required. With her presence in X-Men: First Class and a bright career ahead of her, we can expect to see great things. Posted on 22nd March 2012 11th June 2015 by Matthew Stogdon	This entry was posted in Reviews. Bookmark the permalink.